This week’s article is all about being mindful of the way we look at loved ones. Looking at someone with loving eyes can bring a loving universe. Without probably realising it. We use loving eyes when we are falling in love, or when we see a new baby or a cute animal but why don’t we use them more often? The usual way we look at things is not loving. It is either neutral or worse negative and critical. There are five types of eyes described in Buddhist teaching, the first is the human eye, the second is the divine eye, the third is called the wisdom eye, the fourth eye is called the dharma eye and finally the fifth is the Buddha eye. 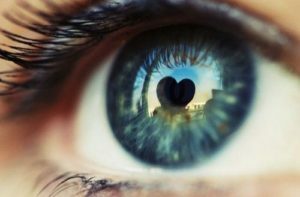 When we practice loving eyes, we catch a glimpse through the fourth eye, the eye of bodhisattva, seeing with loving eyes is not just a visual experience. When we touch something with loving eyes, we bring a certain warmth to others, but we also feel the warmth radiating back to us and we begin to wonder is everything in the world made of love? And have I been blocking that out? We believe practicing loving eyes with your partner, or your close family and friends will bring you a lot of love, confidence and warmth in your relationships and a positive attitude in many different levels such as showing or accepting love, self-esteem and good communication. We have been inspired by the fabulous Jan Chozen Bays, Author of “How to train a wild elephant” and his many different daily mindfulness practices for living life more fully and joyfully.